There’s a beautiful nip in the air. Finally. November thoroughly confused us with its hot, cool, blistery and rain-swept mood swings. December brings with it redemption. And an abundance of activities to indulge in as you make your countdown to the new year. A huge shoutout for the month that brings with it orange sunsets, longer nights and a season of revelry. The Centrestage Festival is back with its fifth edition of premiering plays. Audiences in the city get the opportunity to experience a host of talented newcomers and veterans take stock of the beautiful auditoriums of the NCPA. Our picks: Nanimaa (November 30, 5pm), a Gujarati play about the chance meeting of an estranged grandson with his grandma and the quirky relationship that unfolds, Yerma (December 5, 7pm), a Kathak rendition of a Spanish play and Saag Meat (December 7, 7pm), one where the fantastic Seema Pahwa cooks the titular dish as part of her act! Promoting German fare in the city with an evening of specially brewed beer, music with German band Die Vagabunden and ample scope for gluttony, the Oktoberfest storms Race Course. Everyone on Twitter knows that this one’s been creating a lot of buzz for all the wrong reasons this year. However, there are quite a few great things happening which you don’t want to miss! One of our favourite authors, Mira Jacob, will be attending (read our review of her book here), Daman Singh speaks at a talk titled My Father Not The PM with Siddharth Varadarajan; Naseeruddin Shah and Sanjna Kapoor have a session post which the former and Ratna Pathak Shah perform Beastly Tales; and for all you happy teens and young adult fiction lovers, there’s a talk on The Fault in Our Stars! Sundays just got better. Head to this suburban stretch every week and see one side of the road cordoned off for cycling, skating, games, yoga, dance and happy strolling; Sunday streets are made busier by bursts of art, colour and chattering. 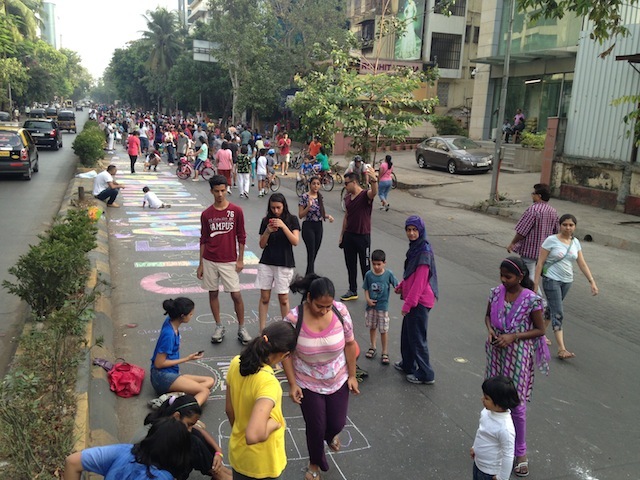 It’s a super initiative by 15 NGOs in Mumbai in a bid to promote cleaner, happier times. Promoting the role of women behind the scenes in cinema and encouraging new filmmakers with a chance to showcase their work, the second edition of the MWFF will showcase 150 films and include master classes, workshops and concerts as part of their itinerary. A motley group of actors comes together for this play revolving around the struggles and moods of a close-knit family unravelling due to a financial crisis. Rakesh Bedi, Avtar Gill, Manju Sharma make the cast of this production that premiered at the Prithvi Festival. Bringing for you the eclectic quartet of Bonobo, Paul Potts, Snarky Puppy and Dislocate Theatre is the Johnnie Walker event. Never before have these artists visited the country and fans are gearing up to rage the night away. The Chainsmokers, Steve Aoki and Major Lazer are just some of the artists announced for the first ever edition of this festival, also happening at Delhi and Bengaluru. Three days of living in your own fantasy world. Play dress up with your favourite cartoon, comic, film character in mind. We encountered a feisty Lisbeth Salander, a Powerpuff Girls trio and way too many Men in Black last year. 2014 presents Mark Gatiss! But, don’t you want to meet Mycroft Holmes? This cutesy market is back. Two days of fancy shopping, capoeira, song and dance await. Trust Bandra to carry off this art attack. Commencing from the Kanheri Caves, this medium level trek takes you to an unrestricted journey of the SGNP with the birds for company. Reward: Encountering flora and fauna of the park at such close quarters and a magnificent view of lakes Tulsi, Vihar and Powai from the top.